How To Say Excuse Me In Japanese – Learn It Now! Your mom is probably the one who taught you manners when you were a kid, but that was all in English, am I right? If you want to be polite while visiting Japan, then you’ll need to learn some new words. And in particular, how to say excuse me in Japanese. The cool thing about Japanese, is the wide range of expressions you can use in order to say the same things. Did I say “cool”? Perhaps I meant frustrating, lol! But no really, there are a number of phrases and expressions that you can use when speaking Japanese that all translate into “excuse me” in English, but the main difference between them is the context of when you’ll use one over the other. For example, you use one word when you accidentally bump into somebody, and a different word when entering into someone’s home or office. Let’s check out each of these different words now, along with the explanations on when they should be used. The first word I want to cover will be the most useful for you to know and use. It is すみません sumimasen and is equivalent to the English “excuse me” when you feel like you’re bothering someone. This could be if you accidentally step on their foot, interrupt them while they’re working on something, or many other daily situations. As for me, I work in an office that has a really long, and really narrow hallway that receives a lot of foot traffic each and every day. When you’re going down this hall, and you see someone coming at you, you both have to hug opposite sides of the walls in order to avoid a collision. In situations like this, I find myself saying “excuse me” or “sorry” a lot of the times, because it’s kind of awkward being that close to someone who is you co-worker. This is the sort of situation that is perfect for すみません. If you’ve read some of the other posts on this blog, you’ll know that this same word can also be used to say sorry or even thank you in Japanese and it all depends on the context of the situation. So don’t worry about misusing this word, or ever overusing it. It’s one of those safe, nice words to use a lot. Something that’s interesting to note when it comes to the difference between cultures is how you behave when you sit down at a restaurant. In America, you sit there and wait for the waiter or waitress to come and take your order, but in Japan you actually raise you hand in the air and say すみません in order to let the staff know that you are ready to order. This is good to know, because if you’re visiting Japan for the first time, you might end up sitting there for a long time wondering why no one has come by to serve you! It’s one of those things that seems completely reversed between our two cultures. If you’ve ever watched a lot of Japanese shows that have people working in an office or other formal situations, then you’ve no doubt come across this next phrase. The full version of it is 失礼します shitsurei shimasu and like all of the other phrases we’ll cover in this article, it gets translated as “excuse me” in English, but there are a couple things you should know that make it different from すみません. First let’s take a look at the two words it uses. The first one is 失礼 shitsurei which literally means “discourtesy” in Japanese and gets used a lot when one person says that someone was rude to them. This is a way of acknowledging that your actions are imposing on the other person, and taking up their valuable time. It’s often used right after a person enters someone’s else office to speak with them, and then again right before they leave. The interesting thing is that this word will be used even if the person entering the room was summoned there! This word is most often used when speaking to those who are above you in social status, such as your boss or a very important guest that may be visiting your company. And many times in anime it will be used by a student who has been called before the “all powerful student council” for whatever reason. It’s a little to stiff to use with friends and family, so you can revert to すみません when you’re not in a situation that requires you to act polite and professional. Have you ever tried to get someone’s attention, but it was a little hard due to the crowd of people surrounding them or you? Usually in English we will sort of yell out either “Hey!” or “Excuse me!” as simply a way to get the other person to notice that you want to talk with them about something. Well, in Japanese there is an equivalent word to use in these same situations. The word is ちょっと chotto and it’s one of those super useful words that has a lot of versatility and uses. One of those other common uses happens to be “no” when you want to turn down an invitation to go to the movies, or out on a date with someone you’re not too wild about. What’s interesting about this word is that the way people say it will change for each of the different meanings. Not the pronunciation of the word per se, but rather the loudness or force of it changes when they mean one thing, or something else. For the purposes of today’s lesson, you would say ちょっと with pretty much the same feeling as you would with the English “Uh, excuse me!” that you use when trying to get some help from a store employee who is about to disappear into the backroom. Nice and polite, but loud enough so that you can make sure that the other person hears you and turns your way. The last phrase that I wanted to cover today is kind of similar to the second one we went over (失礼します) which gets used a lot when entering a room and “intruding” on someone. In this next case however, it is used primarily when entering into someone’s house (usually a friend) or even sometimes their personal room. The phrase is お邪魔します o jama shimasu and the primary word in it is 邪魔 jama which means “nuisance” in Japanese. The お is attached for politeness, and you already know about します from the earlier section, so when we take a look at this phrase in its entirety, it translates as something like “I am politely bothering you” or “I honorably disturb” in English. The other way you could go about it is to just think of it as a set phrase used when entering someone else’s home. When you are leaving a friend’s house, there are many ways to say goodbye, but one option that you have available to you is お邪魔しました o jama shimashita which is the same phrase as above, but conjugated into the past tense. So it would be more like saying, “sorry to have bothered you” as a farewell acknowledgement. The Japanese culture is known for being extremely polite. One of the ways that this is expressed, is when dealing with foreigners. For the most part, it’s not expected that you will know and speak Japanese when you visit Japan on holiday and such. But that’s one of the best reasons to learn a little Japanese, and then to use it correctly and politely. You will surprise a lot of people in a great way! So I hope that the phrases and explanations that I’ve given here today were easy to learn and understand. I know that they’ll be useful for you the next time you have an opportunity to use them! What other ways have you used to say excuse me? Have you heard these words before in anime or TV shows? With all the honor and respect in Japanese culture, I think it would be hard to judge the appropriate setting to use each different form of excuse me, without offending someone, so I would stick with sumimasen. I saw a Japan documentary tonight on the nuclear power plant meltdown, and the owners had to get on their knees, bow and accept public humiliation for the disaster. I would love to see that in America, but never will! They have such a regard for respect in Japan! I think that it is very different that you would call the waiter when you are ready, but that would be rather useful! Sometimes in America, we had to say “pardon me miss, can I have the check”. Otherwise you would have an uncomfortable wait to leave. One old Saturday Night Live episode had one actor saying, well excuuuuuuuse, meeeeee! A very sarcastic,rude, but funny way of using the term. Thank for the enjoyable time I spent on your site, I will have to return! Yeah, the language is so big and there are so many different situations that call for alternative versions of the same words, that it’s pretty easy for the learner to get things mixed up. Picking the most common word and sticking with it is a solid plan. 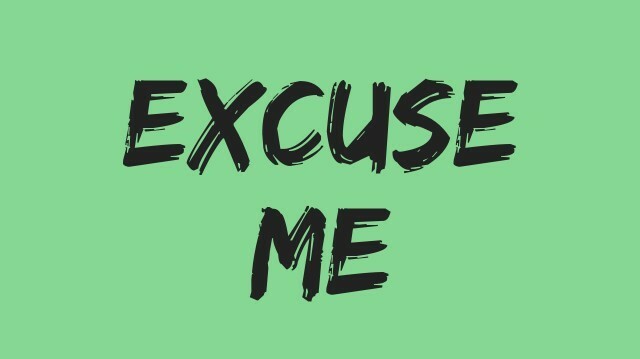 As a non-Japanese person, you given a pass for most situations, and so knowing at least this one word for excuse me will still take you pretty far. Yeah, it’s pretty interesting the differences between cultures when it comes to taking responsibility for something bad that has happened while you were in charge. The Japanese people are very admirable in this regards, and hopefully some of their humility will be passed on to people in other parts of the world. Frankly I’m someone who loves to learn different languages. Most often I find that people are more happier and easily get along with you if you can just say a greeting in their mother tongue, that is their local language. Japanese is one of the most useful languages worth learning. And I will do my best to get the basics. Today you have thought me two things, how to say excuse me in Japanese when I inconvenience someone and then when I enter into someone’s room. Although it was not easy digesting, especially because my brain is a bit fatigued after a long hours of work and reading this article. Let me see if I remember those two phrases well. If I inconvenient someone, either by disturbing them, stepping on their foot or interrupt them, the right worth to use is すみません sumimasen (which is translated into English excuse me) right? And then if I enter into someone’s house the right excuse phrase to use here is, お邪魔します o jama shimasu, right? I have Bookmarked this page for reference later, as i said, my brain feels a bit tired and so I need to have some rest, later on, I will come here and learn more. Hey Stephen, you got it! If you can remember what you’ve written, then you should be good whenever you find yourself in one of those situations. I totally get that the article is packed with information and can cause fatigue, but you’ve got the right idea with bookmarking the page so that you can reference back to it at a later time. That’s what I really try to do with my whole site, be a useful reference that people can use as a part of their stratigy for learning Japanese. Let me know if you ever have any other questions! Thank you this is much appreciated! It is good to see someone (you) and a culture (Japanese) who focus on being courteous an polite. Your article helped me to not just understand your specific topic on how to say excuse me in Japanese, but also understand a lot more about the Japanese culture. Hey Dave, no problem! Yeah, I know that Americans such as myself are rather notorious around the world for being kind of on the self-centered side when it comes to things like other cultures and such. But of course it really depends on the individual, and there are plenty of people who like to learn about the Japanese culture and their customs, and then to participate in a respectful way.